Stephen Charrier, President of Rollerblade USA, and Rob Gill, of InlineSkates.com, review the 2015 Rollerblade Twister 80 Mens and Womens Urban Inline Skates. So, we're talking about the Twister 80 men's and women's skates from Rollerblade. Really unique skate in the Rollerblade lineup. The biggest feature on this is the molded shell. Yeah, so molded skates, this is part of our urban skate collection, Rob, and they're made up of molded skates. Molded skates are really good for transferring energy and giving power to the skater. For sure. And talk a little bit about the fit the customer's going to get especially with that molded shell. Well, it's a really precise type fit. If you're skating up hill, I mean, you feel it immediately that when you push off on this skate, it transmits that energy directly to the wheel. For sure. And then great ventilation on this skate too. Yeah, it's very ventilated. There's a lot of ventilation throughout this skate. Closure system too - we have 2 buckles. A buckle at the top here, it's a locking buckle and then in the instep here, there's also a ratcheting buckle here that really locks you down into the skate and gives you a solid fit. For sure, and then talking about it as an urban skate, kind of that go anywhere, do anything type of skate, what really helps there is the frame length on this skate, right? Yeah, so this is 4 80mm wheels and 243mm Hot Rod Frame so the frame is shorter. That's going to make this skate really maneuverable, easy to turn like that so it's very quick, you'd say. Definitely. And then talking about the wheels a little bit too. A little different profile here than what you're getting in say like a Macroblade. They are. These are Supreme Wheels so it's high-rebound, high performance wheel and what Rob's talking about is the profile of the wheel as rounder like that, fuller so the skate corners better. It's going to hold an edge better. For sure. And then also especially in a molded shell, a little bit of shock absorption for the customer too. Yep, there's a shock absorber under the heel. You know, this skate is designed, it's kind of a utility product, you'd say, kind of go anywhere. But it's really good for maneuvering around, we call it urban skating, whatever. It does come with a brake in the box, it's not on the skate now. A lot of people choose to not skate with a brake on the product. For sure. And so, in the Twister 80, who is the customer here? You know, it's funny, it's our most requested product worldwide on our website. So, it's got a huge range of people that use it for a lot of different things. But it's a reliable, strong fitting, maneuverable skate that almost anyone can skate on. Awesome. 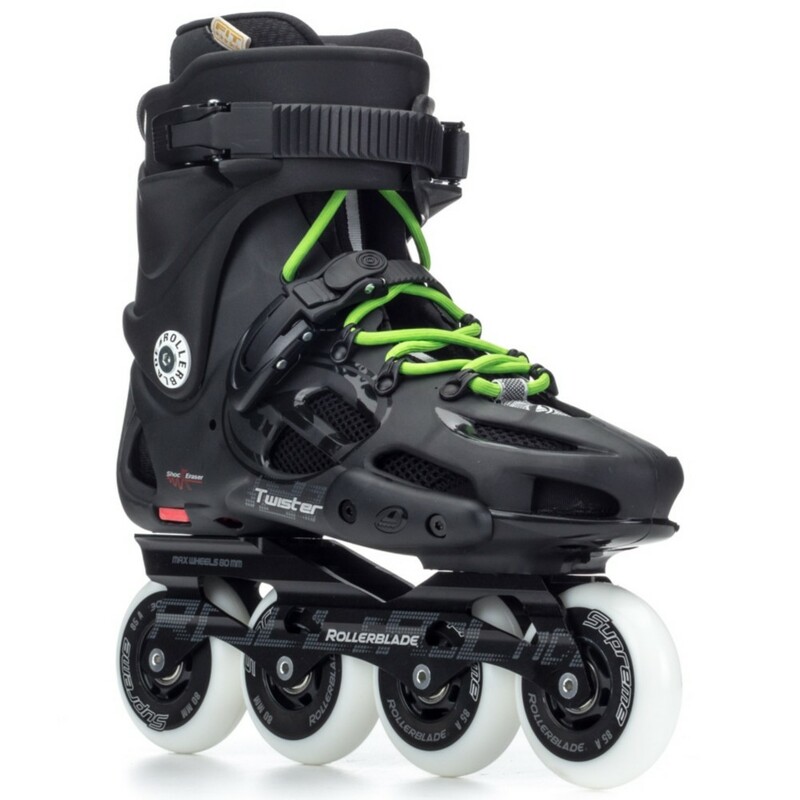 So, really cool skate - the Twister 80 men's and women's from Rollerblade. Thanks for joining us on the Daily Spin and you can check them out on inlineskates.com.